Smart Phone Stand is the perfect desk accessory to promote your brand. 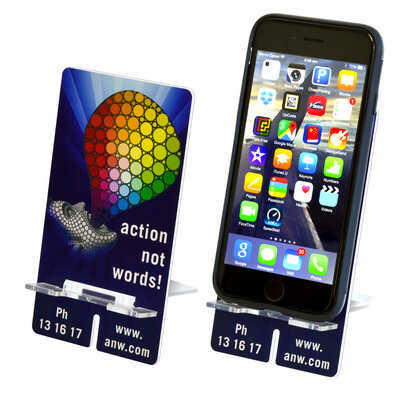 Printed in full colour, this phone stand ensures that your logo and message stands out above the desk for all to see. Supplied flat packed (ideal for mailing). 13cm high x 7cm wide. Poly Bag. White. Price includes: Full Colour Print. Setup is included.